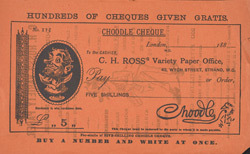 This is an advertisement for the Christmas edition of C. H. Ross’ Variety Paper, a weekly comic published in the late 19th century. Developments in the printing industry meant that it was faster, easier and cheaper than ever before to produce newspapers, periodicals and comics. Many of these were aimed at the middle and working classes who would have for the first time had a limited amount of disposable income to spend as they pleased and as literacy rates were also increasing at this time, comics were a popular choice.